So our local night club is set to become three shops/flats. What a disaster for the Town. Swanage RIP. Can this not be stopped in planning? At the Swanage Town Council meeting a little while ago, Gary Suttle raised the issue with Steve Dring (Core Strategy) that the second home council tax does not get reinvested back into Purbeck but disappears into the depths of Dorset. Could we not encourage Tax 200 and lobby to make sure that all of this tax supports either affordable local affordable housing or community sports facilities for Swanage and its villages. Can somebody from the 70's throw some light on the discussions that took place at this time re Purbeck this side of the bridge having its own local gov and economy ! Ive heard something about it but wasn't old enough to be engaged in the discussions at this time. It would be interesting to hear how far this got? 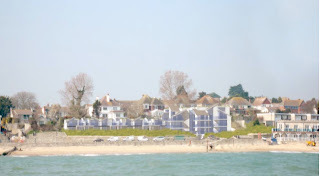 The De Moulham trust are asking for our opinions re: Shore House redevelopment. Comments forms are available from the Town Hall, or on www.swanage.gov.uk - well, that's what it said in the announcement, but I couldn't find one. OPEN SPACES, FOOTWAYS AND ROADWAYS FOR THE BENEFIT OF THE INHABITANTS OF THE TOWN OF SWANAGE GIFTED BY THE WILL OF THE LATE ARTHUR RAINSFORD MOWLEM FRCS TOGETHER WITH THE BENEFIT OF COVENANTS ATTACHING TO THE LAND. I see that there is a poll on the PDC website specifically about where to have a large new supermarket (or whether one is needed at all). Sorry about the short notice. Do you all know about the consultation exercise by Purbeck District Council taking place at The Mowlem * on the Purbeck Core Strategy (mainly where the options are for building new housing in Purbeck in general and Swanage in particular) on Wednesday the 21st of October - 4-8pm? Many visitors to Swanage are amazed at how beautiful it is - can we really not do anything about the decrepit old restaurant near the pier? Are you aware that Purbeck Rail Partnership requires between £2m and £3m for signalling at Wareham/Worgret so that daily passenger trains from the main line can access Swanage Branch? Without this money it will not happen! Swanage Town council have just sold Swanage Bay view Caravan Park for £7.2million Do you think that some of this should be directed towards the signalling... We could get the train to anywhere in the country! If you agree there will be petitions at the Red Lion, and Jurassic Outdoor, hopefully other places too, and I will be going round town asking for signatures. Please sign as this could benefit the town so much, Both the businesses and their income and the locals who will be able to get elsewhere without having to use an unreliable and expensive bus service. 1. Decisions concerning policy and expenditure affecting councils are made at meetings of Common Purpose that bypass the democratic, executive and scrutiny functions of the council. This is what Common Purpose calls 'leading beyond authority'. 2. Members of Common Purpose, which includes senior council officers, are chosen by Common Purpose for their value to Common Purpose and trained at ratepayers' expense, in spite of the fact that these costs are of no tangible benefit to the taxpayer. 3. The so-called 'graduates' or members of Common Purpose use unaccounted council employee time and resources for the business of Common Purpose and, as with their so-called training, the activities of Common Purpose within councils often escaped the attention of the Full Council, Cabinet and Scrutiny Panel. 4. Meetings of Common Purpose are held using a corporate account, off-books, to pay for the hospitality at these meetings. 5. Citizens are not only lied-to when questions are asked about Common Purpose, but are not even allowed to know which council officers have received the so-called training at the taxpayers' expense, and legitimate requests are still being unlawfully withheld. 6. Common Purpose coaches its members on how to avoid answering Freedom of Information requests and how to break the Data Protection Act with unlawful disclosures. 7. Common Purpose encourages its members to identify 12-15 year olds for grooming before placement for so-called 'Your Turn' training without any evidence of having carried out the statutory criminal safety checks. 8. Those identified with Common Purpose, in any capacity or association, are among the same people determined as either corrupt or behind the worst and continuing abuses of citizens. Some of you may know that there is currently a government consultation going on about the future funding of care provision. I have been given the opportunity to attend a meeting with Jim Knight and Baroness Royall (the Leader of the House of Lords) to discuss care provision in South Dorset. If anyone has any strong views/experiences, please let me know as soon as possible. The meeting is this Friday 16th. You can always email me directly on mail(at)mikehadley.net if you wish. Anyone know anything about the big fire at Quarr Farm on Thursday? I hear it burned for over five hours..
On 15 October, Darwin takes over Swanage Bay View Holiday Park. The Council will receive 7.25 million pounds. There have been no official announcements about any changes that are due to take place after that date - some of which will impact us all. 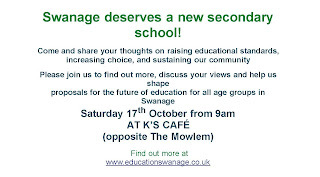 We need a thread - call it SBV Transition News - so that owners at the Park, the residents of Swanage, and anyone else can post updates as and when they are announced. Otherwise rumours will spread unnecessarily (at least, within this forum rumours can be challenged and corrected). Let's aim to keep it factual and civilised! If you want to raise a new topic, post your comment in this section — just click first on Comments below, then type in post a comment (top right of the next window). Can you choose a title for your post, please? Sometimes it's hard to work out what a comment is about and what the subject is. A new heading will soon be set up, allowing others to see and add their own comments. It seems it's sometimes easier to click on 'Post anonymously' than to open an account in your name - you can always add your name to your message. We try to keep posts civilized. And any posts that become too provocative, insulting, threatening or otherwise unpleasant will be deleted.